Don't come looking here for green beer events. I better not see any of you with green in your beer, unless it's green glitter. No wait, what am I saying? I don't want to see that either. Behave. Winter is going out with a bang, but no worries, there are plenty of beer and beer events to see you through this last blast of winter. 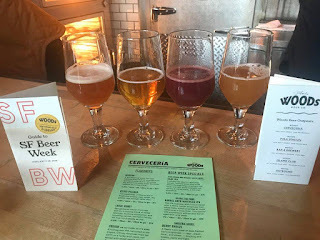 Saturday proved to be, no surprise, another great day for SFBW 2018. It was the day I allocated to Oakland and Berkeley and it began at Drake's Dealership in North Oakland with a meetup of my sister-in-law and two nieces. On one hand, I was really there for the food; I knew the beer would follow if for no other reason than Drake's 30 years of excellence in Bay Area brewing. The brunch event was meant to showcase a collaboration beer with Beachwood in Southern California, a routinely award-winning brewery that you should seek out where possible. But the staff seemed completely overwhelmed and it turned out to be a one-beer plus food kickoff to my day. Albeit, a 90 minute, 1 beer kickoff. The atmosphere, including live jazz for the event, is unbeatable with the large open-air space built within the skeleton of a former car dealership. No worries, there'd be plenty more beer to find elsewhere. The next stop took me and my good beer wing people to Woods Beer Co. This made the second stop at a Woods location (remember them from my Thursday highlights?) for me during SFBW '18 and again did not disappoint. This day's special Woods release focused on the Divine Origins series and showcased two beers - a base beer fermented with a white grape, Fiano, in neutral oak barrels and the same base beer fermented with a red grape, Merlot, also in neutral oak. It's been a while since I've had such a well-done mashup of the beer and wine worlds. Again, Woods gained another brewing star in my book and I'm already looking forward to the next visit(s). Then it was off to Rare Barrel which was hosting a Women In Beer event, complete with roughly 15 female brewers mostly from the Bay Area or elsewhere in California. Much as dabbling Rare Barrel beers should be done without hesitation, okay well I did that too with the excellent Ensorcelled, I wanted to make a point of checking out a few of the guest beers. The Salted Caramel Stout from Breakside Brewing (Portland, Ore.) and London Calling Bitter (Redwood City, Calif.) certainly did not disappoint. $2 from each beer went to the Pink Boots Society, adding to the significance of the event. Love the atmosphere at Rare Barrel and was happy to see a solid, but not overwhelming, crowd. It was here that my co-conspirators went their own way and I hitched my wagon now to the Tasty McDole caravan. The last stop of the night was the Celebrator Magazine 30th anniversary party. These parties, hosted by the inimitable publisher Tom Dalldorf, always look like the proper, just-about-over-the-top celebration of beer that you'd expect. The last I'd been to was all the way back in 2008 - the magazine's 20th - when it was staged at the downtown Oakland Marriott. For the last at least 8 years, it's been held at Trumer Brewery in northwest Berkeley. Much more conducive to a good beer festival. Plus, Jack-On-A-Stick agreed. The east coast writer for Celebrator - Jack Curtin - was in attendance, in a manner speaking and his co-writers certainly appreciated his appearance, though maybe not the Trumer staff so much since minutes after the group picture was taken, JOASt was confiscated. The good thing about being an east coast interloper at an event like this is that most beers are new to me. Not so much the breweries or at least their names - however, these days it's harder than ever to keep up even with name recognition now that the State of California now touts over 900 brewing establishments! Yet for all the new breweries, there are still the stalwarts such as Anchor, Bear Republic, Marin, Russian River, and many others bringing new beers (and even that "old one", Pliny The Younger). Was there one beer that jumped out at me? Difficult to say, but sitting here more than a a week later, I realize that I can't get the chocolate aroma forward and Munich malt-based Hellesexy out of my mind from New Bohemia in Santa Cruz. Or maybe it was just the perfect break that I needed from so many hop-centric beers. Back from Berkeley by way of BART train to downtown. I was teetering at this point between heading to Sycamore (Firestone Walker), Hopwater Distribution (North Coast), or The Willows (San Diego breweries) for their respective events, but I knew by this point I'd pressed my luck as far as I felt necessary (boy, am I getting old, or what?!) and called it another successful day. Sunday brought nearly a full day of SFBW frivolity before heading out the redeye back to the east coast. I'd originally considered San Leandro to search out a young-ish brewery - Cleophus Quealy - as well as stop by the original Drake's. But, the timing and the hassle of dragging luggage with me was not appealing. So, I started where I was always planning to begin and went from there with a downtown San Francisco day to close out my trip. The non-negotiable beginning was for brunch at 21st Amendment. Similar to my thoughts on Magnolia being a must-stop each visit to San Francisco, the original 21st Amendment brewery on 2nd Street (near AT&T Park) has seen quite a bit of me over the years as well. I'm fond of saying that fruit usually does not have a place on the rim of my beer glass, but at 21A, I make an exception for the perfectly natural and acceptable garnishing of the Hell or High Watermelon Wheat with a wedge of watermelon. But I wasn't there for the watermelon beer on this last day of SFBW. It was the barbecue (chicken, in this case) and the special beers. And for the live music. And for the unplanned meetup with owner Shaun O'Sullivan, Dave McLean (Magnolia), and a handful of others. It was for 90 minutes that turned into three hours. It was for the last day of photo ops with my Philly Special t-shirt. And it was to continue reveling in Super Bowl glory with a couple of like-minded fans who were there in their Eagles jerseys. If I was to make the most of staying in the city, it began with doubling my time at 21A and then filling out the rest of the day with whatever else tasted good. Next up, that meant walking the few short blocks to Black Hammer, a relative newcomer to the city scene. A unique space more or less underneath the elevated I-80 approach to the Bay Bridge was full of similarly minded people. They, like many breweries across the country, are attempting to capitalize on the NEIPA craze and the day's event was entitled "Lazy, Crazy Hazy IPA Sundaze". I generally try to steer away from them. What I did find from Black Hammer was a very good Sparkle Pony Belgian Blonde and a surprisingly pleasing Christmas in Febrewary Spiced Saison. Having rejoined my friend Kevin at this point, we made our way over to Cellarmaker. Though, not technically an event, a stop at Cellarmaker is something I try to do as often as possible as well. Even given their immense popularity, I've still never been there when the crowd is crushing to the point of driving me out. So, it was another handful of beers to help close out my last stop. Some of the usual suspects were on the list (Coffee & Cigarettes and Taco Hands never disappoint), and I added a couple that I've never come across before and again did not leave disappointed. That would be Lost Wisdom Saison and Dobis Plus IPA (100% Citra). My biggest disappointment came after Cellarmaker and that was when my Lyft driver dropped me at my favorite sushi spot for one last meal only to discover that their new hours have them closed on Sundays. A hearty WTF?! If I'd known this, I'd have pivoted to my other last-SF-meal-before-a-redeye-tradition at Mikkeller. But at this point, it would've been cutting it too close for enjoyment and still need to get luggage from hotel and get to airport to do the TSA tango. The SFBW '18, while barely four days long in my experience this year, was worth every minute and bit of effort to see some of what's old, new, and still great about the Bay Area beer scene.